If you happen to own one of the following iOS-powered devices – the iPad, iPad 2, iPhone or iPod touch, then chances are you would have plenty of media stored on them, ready to entertain you at a moment’s notice whenever you are bored while making that daily commute to the office (and back, of course). Needless to say, space is never infinite, and eventually it will be filled up to the brim, but what happens when you have some extra help? This is where the AirStash from Maxell comes in – this device is touted to be the first as well as only wireless flash drive in the market that delivers media streaming alongside two-way wireless document transfer capability. To put it in a nutshell, you no longer need to rely on your iOS device’s internal memory to store your entertainment media – that job has been relegated to the AirStash now. Granted, it means you need to tote around two more devices, but that’s certainly a small price to pay when you think about it, no? Learn more about the AirStash after the jump. Merging the portability of a standard USB flash drive alongside the flexibility of an SD memory card, while boasting the power of a media streamer, this is one convenient device to get your wireless two-way file transfer action going on. The AirStash will rely on a standard USB connection so that there is no need to tote around additional data cables that will further bog you down during your travels. Even better news is this, the AirStash will support the WebDAV industry standard for compatibility with popular apps, among them including Apple’s iWork suite and GoodReader for iOS and WebDAV Navigator for Android. 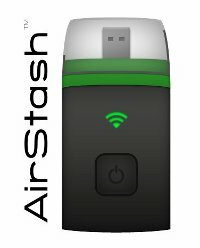 There is also an AirStash+ app that can be downloaded off the App Store without having to fork out a single cent, since it was developed due to professional photographers, letting your AirStash browse and batch import photos in a jiffy.